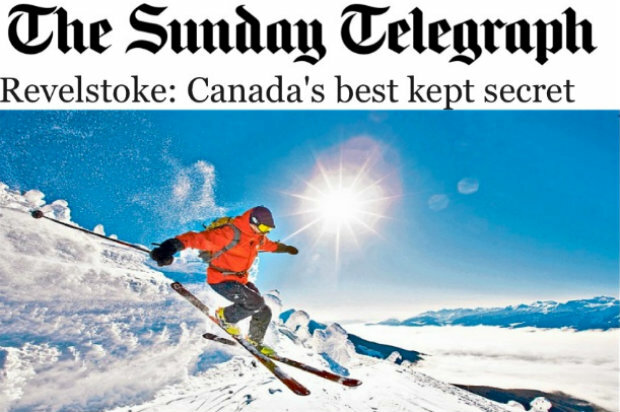 “It’s just another powder day in Revelstoke Mountain Resort, one of the world’s snowiest places, where sharing more than 3,000 acres of fall-line skiing, high-alpine bowls, gladed terrain and North America’s highest lift-serviced vertical drop with just a hundred fellow skiers is ‘normal'”. To complement the amazing skiing, Bighorn offers unrivaled standards of accommodation: “one of the most esteemed private lodges in North America… Bighorn is unique: it offers world-class heli-skiing from a lodge with facilities and service hitherto limited to chalets in resorts like Courchevel and Zermatt”. It’s been a snowy start to the New Year in Revelstoke, with huge dumps of deep fluffy powder. 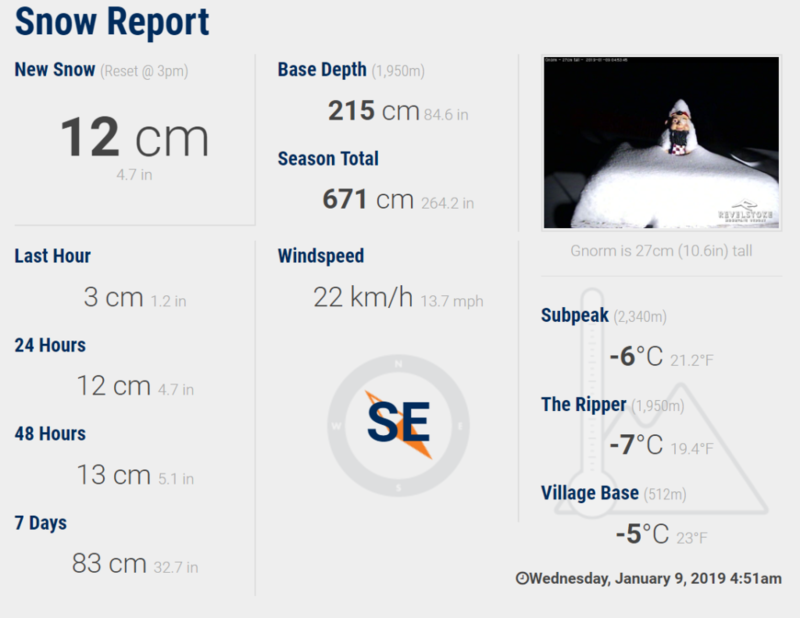 Twenty seven centimetres of new snow has fallen in the last 24 hours alone and another twelve cm is forecast overnight tonight. The skies are set to clear from Wednesday, so there has never been a better time to enjoy skiing the Revy pow! 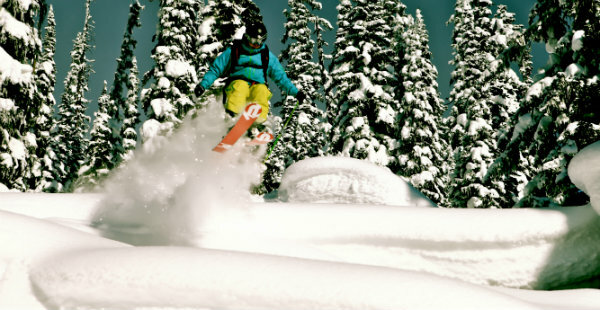 Revelstoke Mountain Resort’s terrain is unbeatable after this type of powder dump. 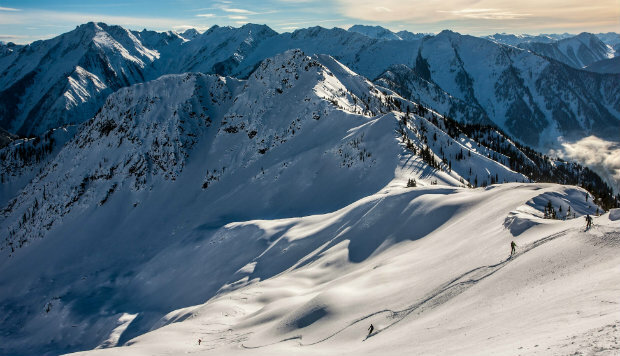 Picture yourself skiing fresh tracks through perfectly gladed tree runs, popping off powder pillows and landing in the deep snow. Guests at Bighorn can make the most of these amazing conditions by flying into the wilderness Selkirk Mountains by helicopter direct from the house helipad. Ski untouched powder peaks all day, only stopping for a rest in the heli as you take a lift to the next unspoilt powder bowl. We still have last minute availability for January 12-19th and limited availability in February and March. Enquire now to secure your space in powder paradise. 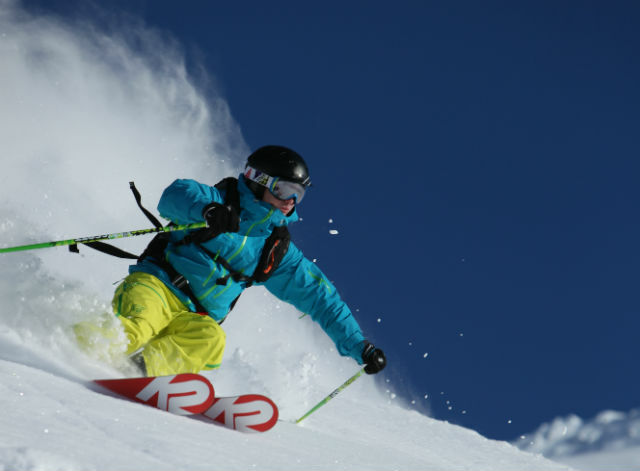 Heliskiing is perceived as a risky activity, although it actually has some safety advantages over resort skiing given that most ski accidents are caused by collisions on crowded pistes. It should be accepted that there are dangers however, but following a few simple precautions can prevent accidents and ensure the safety of your group. Keep an eye out for your buddy and make sure you are aware of where they are skiing. If you are following each other, ski near each other’s tracks and call out for each other when skiing trees. Revelstoke is famed for its incredible tree skiing, but be aware of tree wells – deep holes next to the snow shadow of the trunk. If you fall down a tree well you’ll need your partner close by to pull you out. It may sound obvious, but make sure your brain is in gear and you are listening to what your guide says. Your safety is their number one priority, so you should always heed their instructions. Often they will tell you to ski to the left or right of their tracks, this will be to avoid a hazard. Always stop above your guide – they may have stopped for good reason; above a crevasse, cornice or to asses snow pack. If they tell you to ski a pitch one at a time, then there is good reason for being cautious. Approach the helicopter from the pilot’s side and walk rather than ski up to it. Never walk around the back of the helicopter, the tail blades are dangerous. Look up and be aware of the rotor blades – drag skis, don’t carry them on your shoulder. Once in the cabin wear your seat belt and do not distract the pilot or touch any controls. At the drop-off secure goggles, gloves and backpacks before the heli takes off – if they blow away don’t chase them. The heliski operators at Bighorn will equip guests with avalanche rescue equipment including a shovel, probe, transceiver and group radio. You’ll receive full training on how to use the equipment, firstly via a safety video screened in the Bighorn cinema room and then by practicing rescue scenarios on the snowy slopes around the lodge. Conditions in the mountains change quickly, so ski with respect for Mother Nature. 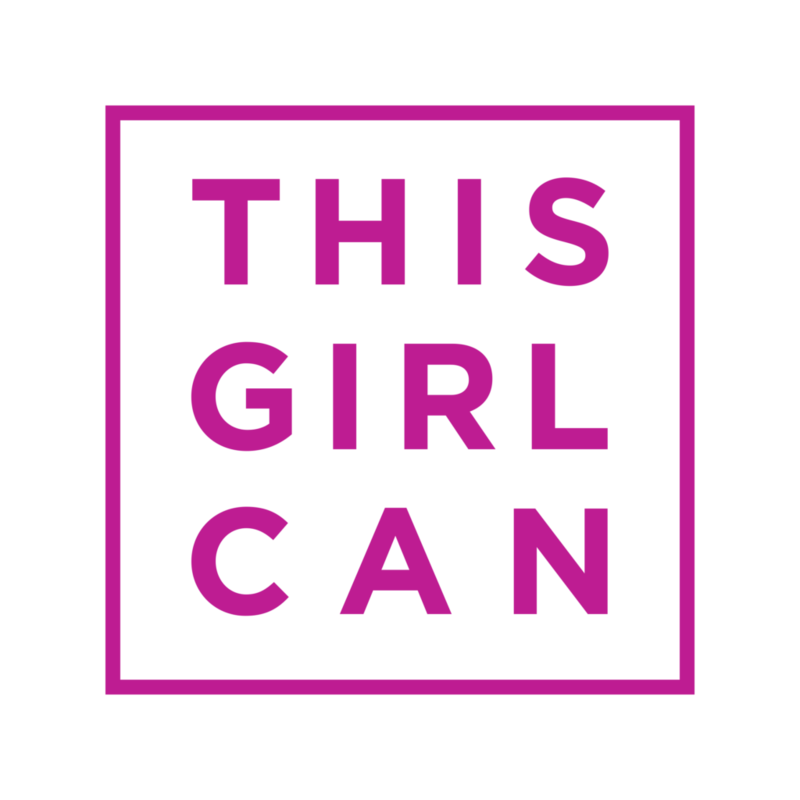 Your guide will give you advice on how and where to ski, but use your common sense – don’t go over an edge if you don’t know what is on the other side, look ahead and plan where you want to ski. If you ski with respect for the mountains and your guide, heliskiing is perhaps the most rewarding adventure you’ll ever have. Find out more about the ultimate thrill here.